World No. 1. Three Seven (777) Travel Manicure Grooming Kit Nail Clipper Set (10 PCs, TS-2100BG), MADE IN KOREA, SINCE 1975. Lifetime Warranty. Authorized Exclusive Distributor (Three Seven (777)-USA) of Three Seven (777) Products in US and Canada. New Sealed Genuine Original World No. 1. Three Seven (777) Travel Manicure Pedicure Grooming Kit Set - Included (Total 10 Pcs: Nail Clipper, Toe Nail Clipper, Cuticle Trimmer, Tweezers, Beauty Scissors, Safety Scissors, File, Double-sided Push Stick, V-Shaped Push Stick, Ear pick: TS-2100BG), Made in Korea, Since 1975. Not 3rd Party, Original Three Seven (777) Product. Authorized Exclusive Distributor (Three Seven (777)-USA) of Three Seven (777) Products in US and Canada. LIFETIME WARRANTY. World No. 1 Quality & Technology Since 1975. MADE IN KOREA. Lifetime Warranty against Manufacturing Defects Only. This warranty program covers Three Seven products purchased from Three Seven (777)-USA and applies to all types of manufacturing defects. The warranty program does not cover product that is lost, stolen, dropped, shattered by customer's fault or any other damage that is caused by the consumer. If you have any questions about this product by Three Seven (777), contact us by completing and submitting the form below. If you are looking for a specif part number, please include it with your message. 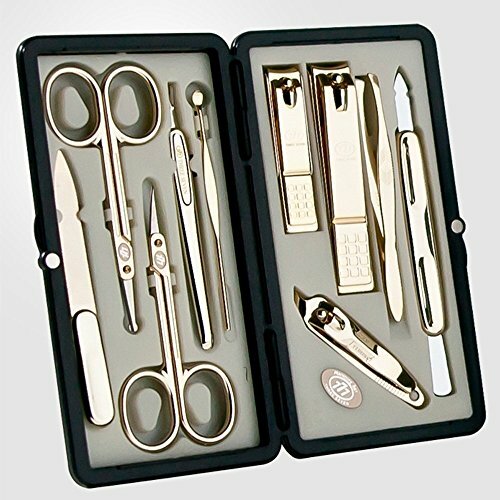 Amazing Professional Manicure Travel Set for men and women. 12 pieces kit of Stainless steel manicure & Pedicure clipping and trimming tools in an attractive Beautiful gold metallic case.